All surveillance system use monitors but why is one monitor chosen over another? Are integrators selective in what types they specify? 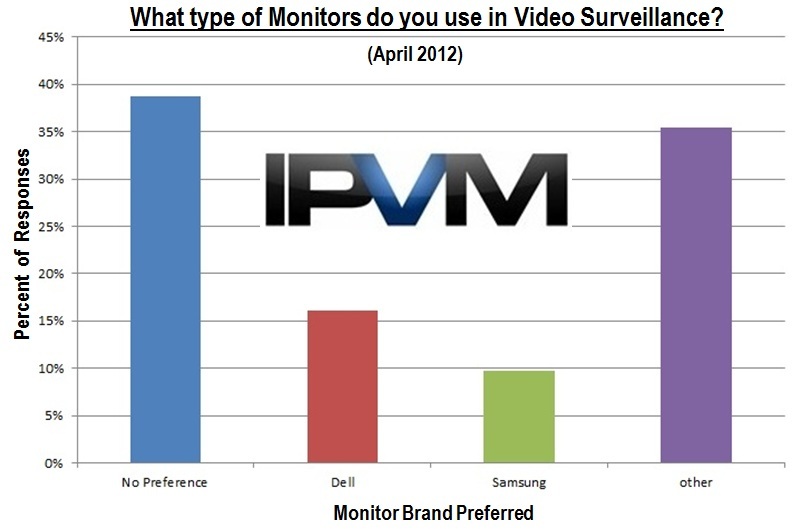 We recently surveyed integrators on how particular they are when recommending monitors used for video surveillance. In the note, we examine their answers and the trends that emerged. Our question to integrators was "What type of monitors do you use to watch surveillance video? Any specific brands?" We phrased this to be flexible enough that integrators could explain their approach. As a result, integrators chose to answer this question in several ways. While some integrators chose to address the type of technology used (LED vs LCD vs Plasma) or the size of the display, cost and brand based selection were the criteria most often mentioned. By far, the strongest theme that emerges is that most integrators buy monitors based on price. In the graph above, nearly 40% of responses - those indicated by the 'No preference' column - state they select monitors based only on cost. While this may be viewed as surprising given the wide technical specifications of displays available, it is starkly obvious that price, not performance, drive monitor selection. "Any cheap brand will do." "The cheapest. Simply as that." "Any as specified or priced in budget detail"
"If there is a pricing issue on the project, the price - quality of the monitors is the first place we look to cut cost." "Whatever can be gotten quickly for a decent price"
"most times they just want something cheap"
"What ever is available at our wholesaler at the time." "We typically use anything with a name brand that is cheap"
"Unless a specification is involved (ie: public view or command center monitors), we purchase based on cost." "no specific brands. that is mostly about price." "I use typical everyday brands not surveillance grade ones. Customers are not willing to pay 4-5x the cost of surveillance grade ones." When brands were specified, common consumer brands were cited. We conclude these answers indicate that convenient availability is a strong indicator of which monitors are sold. For example, the most popular 'named' brand cited was Dell monitors, indicating that monitors bundled with workstations are used for surveillance. "Mostly Dell for workstations and servers." "Currently, any Computer monitor will do the job"
"Most customers are happy with the standard 19" Widescreen computer monitors"
"Typically Dell. We purchase direct and have a price advantage." "Any standard LCD type of computer screen." "I use PC LCD monitor or LCD TV." "Most of the time video is viewed on a workstation PC monitor." "No specific usually just computer grade lcds"
Interestingly, few answers mentioned 'sizing' monitors based on aspect ratio or resolution. Many responses revealed that HDTV displays are often used as surveillance monitors. In the past, purpose-built 4:3 monitors were the primary choice for displays, but since modern surveillance systems are configurable to work in a variety of aspect ratios, this option has disappeared. "A deciding factor is what we can provide documentation for, a nice PDF datasheet and O&M manual from the manufacturer's website. " "No specific brands. We use LCD TV's "
"Depends on the environment. We use a lot of Samsung LCD TV"
"Generally speaking, any monitor will do so long as it's got the appropriate input." "Nothing fancy, just standard HD wide aspect ratio TV monitor." Almost no consensus exists amongst monitor brands, with nearly 40% having no preference. Equally important, the 'top' cited brand was Dell, a company that essentially re-sells monitors and bundles them with computer systems. In all, nearly 30 different brands were mentioned by about a hundred integrators, showing how scattered preferences were. These results strongly indicate that integrators view surveillance monitors as a 'commodity', and true to form, pricing is the distinctive attribute. Given the inexpensive nature of consumer-grade TV units, we deduce that the market for purpose-built surveillance displays has all but disappeared.